Mexico has offered a reward worth $370,000 (£233,000) for information leading to the arrest of the killers of a leading prosecutor and two guards. 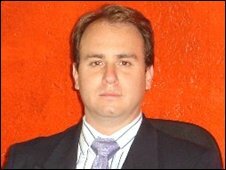 Andres Dimitriadis headed an investigation into organised crime and drugs trafficking in the state of Morelos, near the capital Mexico City. He was shot in his car in the Morelos city of Cuernavaca on Friday as he drove home. Drug-related violence has claimed more than 4,000 lives in Mexico this year. The prosecutor's two bodyguards were also killed in the attack, in which gunmen fired more than 100 rounds of ammunition at the moving vehicle. They struck about 300m (yards) from the local headquarters of the Mexican federal police, the Spanish news agency Efe reports. Mr Dimitriadis may have been killed by members of one of two drug cartels fighting for control of the trade in Morelos, the authorities say. Some 20 other people were killed on Friday alone in similar violent attacks across Mexico. President Felipe Calderon recently deployed tens of thousands of troops to combat the drug-traffickers.